We are fully experienced experts. All of our work is guaranteed, and we're fully insured. We are your local reliable friendly experts, that offer you a professional and honest service, at a fair price. If you have a particular requirement we can arrange and book an appointment promptly! Snare Digital are a local well established company specialising in all aspects of Aerial/TV/Sat installations, repairs and maintenance. We are a small family run business with over 10 years of expertise servicing customers throughout Guildford, Surrey & nearby areas. We are very proud of the reputation that we have built over the years as providers of high quality services that you can be assured and confident of. We are a leading service provider across the region and are a name that you can trust for all professional Aerial/TV related work both large and small. As a company, we are capable, equipped, and experienced enough to handle a range of projects. We also believe that good professional conduct means providing our clients with the best services and value for their money. As a client, you have the right to get the quality and the type of service that you need. We, therefore, ensure that we honour your requirements/specifications. 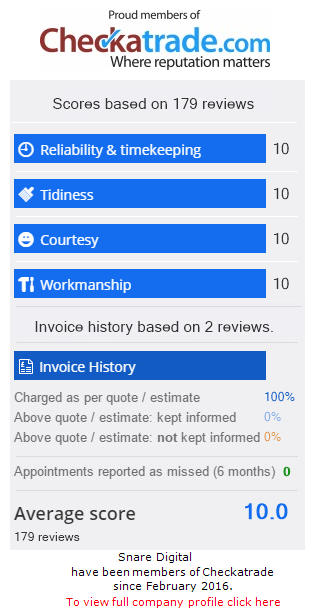 With hundreds of happy customer reviews on Checkatrade Snare Digital are confident that we can successfully undertake whatever project/requirement that you may have. New television cabling installed to living room and bedroom. Checked checked fuse box, changed 3 sockets, advised on electrical fault and light. Fixed and diagnosed broken rooftop aerial.